Magnetic grates are devised to increase the product purity of materials such as drugs, chemicals, plastics, cosmetics, food materials and so on which are free flowing. Magnetic grates can be easily installed in any hopper or floor opening, chute or duct, which makes the free flowing products to come in direct contact with the grate. Any product, containing iron particles which pass through the magnetic grates are attracted to them. Hence, your products will be safe for consuming and also the equipment and facilities will be protected. 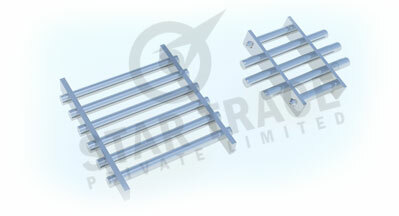 The magnetic grates are well polished and welded for meeting food grade quality. The shell material is made of stainless steel tube. Although the standard working temperature of the magnetic grates is under 80oC, it can be made stable up to 350oC to meet your specific requirements.. The designs that are available are standard type, Easy clean type, single layer and multilayer. Specific designs are also made according to the customers requirements.